This pioneering study is a treasure trove of new information, illustrating the lives and professional experiences of the people involved in such a way as to demonstrate clearly both the obstacles they faced and the status they achieved. Its wealth of detail, in many cases fleshing out the careers of leading Jewish professional figures for the first time, makes engaging reading. The narrative proceeds chronologically with careful attention to social context, starting with the Victorian and Edwardian eras. For the medical profession, the account of subsequent changes begins with the influx of Jews into medical schools after 1914. John Cooper goes on to describe the problems these Jewish medical students, most of them from immigrant families, encountered. Finding employment even as general practitioners was problematic, and almost insurmountable barriers confronted aspirants to consultant status. Afraid of antisemitic claims that Jews were flooding the market, the leaders of Anglo-Jewry even tried in the 1930s to dissuade young Jews from becoming doctors and lawyers. In this context, Cooper also considers the position of refugee doctors before and during the Second World War. The establishment of the National Health Service in 1948 resulted in fundamental changes, particularly in the way in which consultants were selected, and Cooper shows how this permitted Jewish doctors to enter specialties from which they had previously been excluded and to climb to the highest rungs within the medical hierarchy. He summarizes the careers of many prominent Jewish doctors. The experience of Jews in the legal profession, both as solicitors and barristers, is examined in similar detail. Cooper sets the context with a discussion of the treatment of Jewish litigants in the early years of the twentieth century in the Whitechapel County Court and the criminal courts. He shows how the persistence of an anti-Jewish bias in the inter-war period limited opportunities for Jews and dissuaded them from entering the law; he also considers the position of Jewish refugee lawyers who came to England during the 1930s and 1940s. After the war, major changes in the economy and legal system allowed Jewish law firms to expand rapidly, challenging the dominance of the City law firms in the commercial world. Many of these firms consequently began to admit Jewish partners for the first time, and Jewish barristers, hitherto confined to the less remunerative areas of civil and criminal law, were likewise able to enter the more lucrative pastures of company and tax law. From the late 1960s, Jews were also promoted in increasing numbers to position on the High Court Bench. As well as giving a detailed picture of these mainstream developments the book also looks at the careers of Jewish communist, socialist, and maverick lawyers. The story John Cooper tells will appeal not only to readers with a general interest in the subject but also to social historians. It is based on a wide range of sources, including newspapers and professional journals, archival material, law reports, and interviews conducted by the author, and there are detailed indexes of names and subjects. 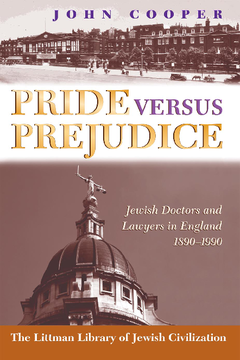 As well as providing an illuminating account of recent Jewish social history, the book makes a valuable contribution to the history of the medical and legal professions and to the scholarly debate as to whether or not antisemitism was of peripheral or central importance in Anglo-Jewish history. John Cooper studied history at Balliol College, Oxford, and was in private legal practice until his retirement. His publications in the field of Jewish social history include 'Eat and Be Satisfied: A Social History of Jewish Food' (1993), 'The Child in Jewish History' (1996), 'Raphael Lemkin and the Struggle for the Genocide Convention' (2008), and a chapter in 'Jewish Explorations of Sexuality' (1995).